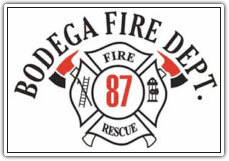 Bodega Volunteer Fire Department. An all volunteer fire department serving Bodega, and it’s surrounding communities. To learn more check the Fire Departments website: http://www.bodegafire.org/.